Kintek's overall conceptual understanding of our business needs and intentions, the ability to translate these into superior technical outcomes and develop certain innovative features for our web site was a key advantage of working with them. They were time-poor but managed to be available, dedicated and meet deadlines in working with us and the 3rd party, front-end graphical designers we were using. Many times in sharing our interest and excitement in what was being developed they went technically and otherwise above what would be expected from merely a fee-for-service provider. It was more like working with a supportive friend, problem solver and business partner. I have had numerous other interactions with Kintek where they have been asked to scope and quote for new and emerging product and technology concepts. They have always delivered as promised. If you are looking for someone who is the cheapest at what they do then that's not Kintek. But if you are seeking superior and creative and update-to-date technology solutions and problem solving and execution in developing web based applications then they are someone you can confidently use. We would not have been able to go from concept to reality as well as we did for our mobile website without Kintek. mynextwine is a mobile wine information site that lets you Get instant, on-the-spot info about all of our featured wines before you buy. Kintek was tasked with finding the best solution to engage customers using QR Codes and Mobile Phones across multiple mobile platforms. After months of research we settled on a mobile website which allows users with iPhones, Android Phones and other smart phones to easily interact with the in store displays and read reviews and rate wine after they have tasted it. We worked closley with NicheStudio who worked on the front end design work. We built the application to work and interact extensively with QR codes. 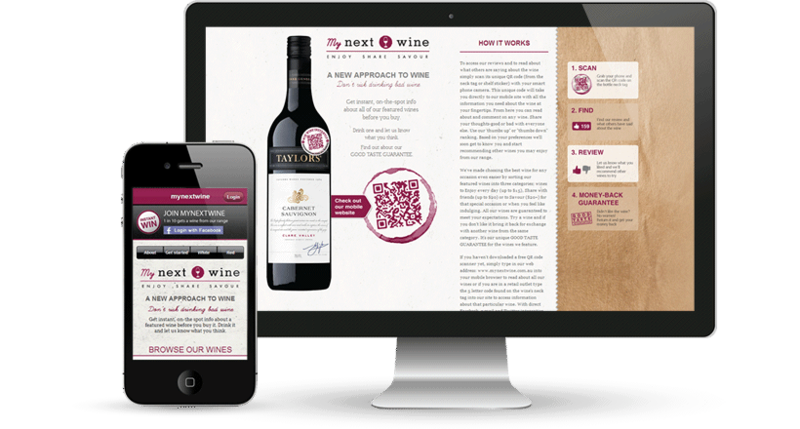 Each wine landing page had a unique code and QR code we tracked individually to see how people were using the application. If you typed in the address on your phone manually users were suggested one of two QR Code scanning applications (which was based on whether you used an iPhone or and Android device). The first page of the app meets users with a simple, intuitive, and visual entry point. The obvious actions are the two wine bottles images, melded together, and the manual ‘add your own unique code here’ script. We build the application and provided the unique codes so people could scan and type in specific codes to go to the page about their wine. 1 in 10 users won a free bottle of wine, and enabled mynextwine to gather useful metrics about their customer base and target demographic. Once users signed in, they were then given a screen showing them if were one of the lucky winners. One great feature was reviews, which allowed normal customers as well experts to rate and review wines. These details could be looked up in-store quickly, letting you easily gauge whether you thought this was the right wine for you. mynextwine had the master of wine Peter Scudamore Smith to seed these reviews based on his own personal preference. The app listed a specific number of reds and white in store, but the idea long term is to have access to all the store wine information.